Colour is a crucial contributor to how we experience a space. Psychology tells us that certain colours can make us feel calm (typically blues and greens), while others energise (those bright reds and yellows). The colours used in your space also tell a story about who you are – in an abstract way. When selling your home, however, the tendency is to strip the colour away. Presenting the space as neutral, conventional home-staging wisdom tells us, allows potential buyers to project their own ideas on the space. But a colourful space invites; buyers can really be immersed in what their new home could look like. Colours are powerful, and this blog will explore how you can use that power to sell. We don’t need to worry about how colour is mixed – what concerns us are the physical effects of colour on a space (and how home staging can use colour to influence a potential buyer). So, what can colour do? We know colour can deeply influence human behaviour – for example, it can change the flavour and desirability of certain foods. Understandably, in your home it is natural to use appropriate colours that highlight the most important aspects of a space. Blue is associated with calmness, competence, and quality. Using light blues in a space has a calming effect. Red is associated with power and love. Red is an intense colour, and can be overwhelming, particularly if it is a saturated red. Red, however, looks great as an accent. Earthier, less-saturated reds can be grounding. Yellow is bright and wholesome. Yellow is a rarer colour for interior decorating, because of its overwhelming quality when used en masse. Bright yellows, like reds, work best as accents. Yellow, when paler, can help a room feel light and bright. Greens are associated with nature and earthiness. Like blue, green can have a calming, restorative effect. When used in pales, it is almost neutral, while deep greens are earthy and add weight in a room. Black has wide associations. From grief and fear, through to being associated with luxury and sophistication. Black has to be used carefully in a home, but can add sophistication when tastefully applied as too much black leaves a space feeling dark. Neutrals (and whites) come in a wide range, but primarily refer to unsaturated earth tones, greys, and whites. These colours lend feelings of purity, lightness, and space. Bedrooms can be staged with blues, neutrals, and accents of red or yellow, to give feelings of brightness and serenity. Some people think colour should remain out of the bedroom – but we believe tasteful application of colour in rugs, throws, or cushions can bring the bedroom to life. Lounges can be decorated more daringly. Unlike bedrooms, they are spaces with plenty of activity. Here we would stage your home with colours to suit the context. Does your lounge open out to the garden? We could pull in greens and earth tones to give a sense of flow inside to outside. If the lounge is more internally focused, bright yellows can make the space pop. Kitchens benefit from brighter colours, which stimulate activity and appetite. Reds and yellows feel at home in the kitchen, while blues feel out of place. In this way, we can use colour to make your space bristle with energy. When someone steps over the threshold, they can be greeted by a home that illustrates its liveability. Be confident in colour. Exploring colour through home staging is a great way to help buyers open their imagination in a space, ultimately helping you sell. 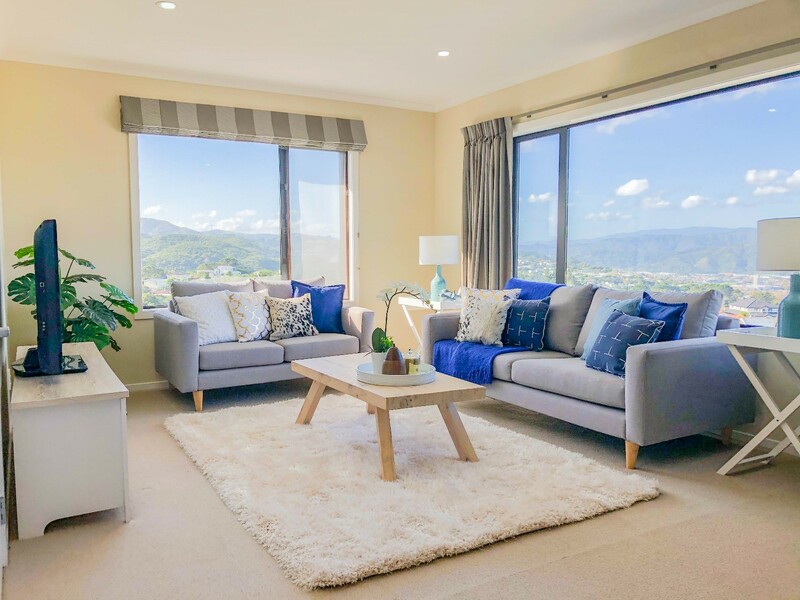 Contact HomeStaged today to find out about our services, and how we can help sell your Wellington home faster with expert home staging.